If you own a truck, you expect it to be capable of handling off-road conditions, heavy loads and be able to protect you if you have a collision. Which is why you are probably thinking about what options you have when it comes to heavy duty truck bumpers. Making sure you have a quality bumper to meet these heavy duty requirements is a must and there is a lot of them to choose from. However, not all heavy duty truck bumpers are made equal. To help you make the best informed choice, we have put together a short list that you should consider to ensure that you get a quality product that you know will perform in every environment and keep you safe when you need it. This is Part 1 of the guide (It got a little large so we broke it down into more manageable chunks), you can continue reading Part 2 here. Go Aries Automotive operates under the parent company GoToAutoAccessories, a company that offers a huge assortment of car and truck accessories such as cargo management products, grille guards and bumpers, light mounts, nerf or step bars, rocker guards, side armors and taillight guards. The Aries Bull Bar is crafted from a 3-inch diameter tubing, bigger than those offered by most companies for a more rugged look. It includes a stainless steel skid plate and provides the utmost protection and great style for your truck. The Aries Bull Bar can be purchased in stainless or black powder coat to match your vehicle’s body color and is available for selected Chevrolet, Dodge, Ford, GMC, Honda, Nissan, Toyota, Jeep and Lincoln trucks and SUVs. The Aries One-Piece Grille Guard on the other hand will give your vehicle a commanding look right off the bat because of its aggressively styled design. It comes in either a brushed aluminum or black finish and will make your vehicle stand out even on the off-road. The Aries One-Piece Grille Guard is available for most Jeeps and the Ford Super Duty pickup trucks. Finally, the Aries Bar provides a vehicle with the ultimate front end protection with 3-inch diameter heavy wall bars and a skid plate that you can get in polished stainless steel or black powder coated carbon. The Aries Bars are good-looking, but it also works great in doing its job. It also installs quickly and easily, with no drilling required. The Aries Bars are available for a wide range of trucks and SUVs across all brands. If you have a Ford Ranger, we have some great bumper options to take a look at, including our favourite and group test winner, the Aries 3053 Black Steel Grille Guard. Installing an Aries bumper on your truck or Jeep is easy as you can see from the video guide below. Rampage Products manufactures a wide range of street and off-road accessories that cater to various types of consumers. Rampage has been in the business for over five years and has continuously built on the company’s commitment to service, quality and product innovation for trucks, Jeeps, SUVs and UTVs. Rampage Products offers tops, step bars, seating, lighting, gas doors, grille and light bars, covers, tow hooks/d-rings, seat covers, bumpers and other interior and exterior accessories. 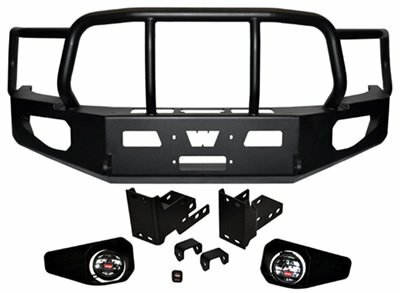 Rampage Products offers three types of front bumpers: the Rampage Recovery Bumper, the Sand Rock Street Bumper and the Dakar Bar and Grille. Rampage Recovery Bumpers are made from a 3/16” heavy steel reinforced with protective, dual-stage, durable black powder coat finish and feature ground level dual light receptacles for 4” lights that maximize light distribution, save space and recessed for protection. Rampage Recovery Bumpers are also equipped with custom welded shackle mounts with clevis 1” D-rings standard. Rampage Recovery Bumpers are only available for Jeeps. On the other hand, the Sand Rock Street Bumpers are designed with 2” upper and 1.5” lower tubes to protect the front bumper and are available for selected trucks and SUVs. 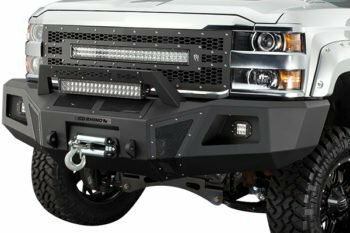 Lastly, Rampage Products also offers the Dakar Bar and Grille, which is a light bar and grille guard that truck and SUV owners can use with or without lights. The Dakar Bar and Grille features four light tabs for 8” lights or smaller and are available in stainless steel or black powder coat. Smittybilt has been making innovative off-road products for trucks, SUVs and Jeeps for more than fifty years and throughout that period, they managed to continuously uphold the standard of excellence that has made them one of the top players in the business. Creator Basil Smith was a four wheel drive enthusiast himself and because of that, he made it his mission to develop great products that support the 4WD lifestyle. He started a machine shop in his garage in 1956, which he called Rock-ett Products and this tradition was continued by his son Tom until after they changed the name to Smittybilt. With over five decades of experience in the off-road industry, you can only expect highly advanced technology and unparalleled craftsmanship in their products. Today, Smittybilt offers over 2,000 different products geared towards the international truck and SUV markets including step pads or nerf bars, lumber racks or contractor racks, billet grilles, Jeep accessories and a lot more. 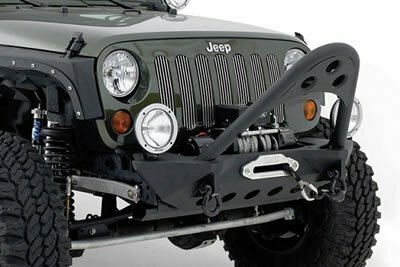 For trucks, Smittybilt offers Grille Savers, which are crafted from 3” tubular steel. It provides heavy duty bumper protection and includes a polished skid plate for optimum protection. 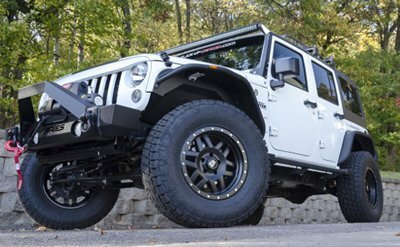 It’s custom-fitted for each application to ensure great strength and the best performance in the off-road. These Smittybilt Bumpers offer great protection along with a clean finished look that enhances the look of any truck. Additionally, Smittybilt also offers RPD Light Bars for a number of trucks. These Smittybilt Bumpers cater to the true Baja enthusiasts and are made from 1.5” 120 tubing and hand formed for each application fo the best fit. 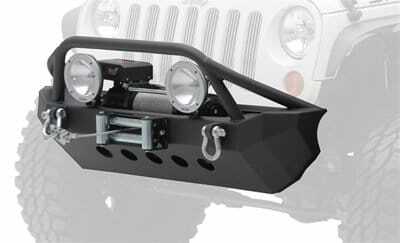 Smittybilt Light Bars can house three 9” diameter or smaller lights and utilize the light tab for extra support. These products require drilling for proper installation. Smittybilt Bumpers come with a 5-year limited warranty for the powdercoat painted finish and a limited lifetime warranty for the polished stainless steel finish. Nasta International manufactures all stainless truck accessories and is under TA-CHEN International, who is one of the world’s leading manufacturers and distributors of stainless steel products. Nasta International only uses stainless steel on all their products right down to the brackets, nuts and bolts to prevent discoloration and maintain its luster and resistance to corrosion, which frequently happens when stainless steel is attached to carbon steel components. Nasta makes step bars, running boards, grille inserts, grille guards and bed rails. Their stainless bumpers or grille guards are made of 304 stainless steel and polished so that it has a mirror-like finish. Nasta Bumpers have a great European style and are offered in 1-piece or 3-piece designs. Nasta Bumpers are available for Chevrolet, Ford and Dodge trucks. Go Rhino! has been a manufacturer of strong, innovative and functional truck and SUV accessories since 1975. They partnered with Xtreme Racks, a company that shares their vision of producing superior quality products for consumers in 2004. Not long after that, Go Rhino! set the standards for functionality, style and durability and even won prestigious awards for their products. Go Rhino! was one of the first companies to introduce top-quality modular grille guards over 30 years ago and they have remained an industry leader ever since. 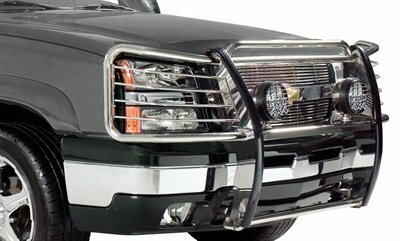 Their rugged bumpers include modular grilles/brush guards with a patented built-in step, winch bumpers, Xtreme Guard Bumpers made from impact-resistant urethane, Charger Front Bars made from a 2.5-3” tubing and even bumpers for vehicles of law enforcement agencies in their Public Safety Division. Go Rhino’s award-winning products, the Stepguards are made from high quality stainless steel with modular construction and are available for a wide range of applications. The Stepguard features a built-in step designed to allow easy access to the hood and engine compartment. It mainly has a polished stainless steel finish, but has double black powder coated side plates. It installs quickly and easily and no drilling is required for most applications. Go Rhino! Stepguards are covered with a limited lifetime warranty. Easy to follow bumper replacement installation video guide for the 2016 Dodge Ram 2500. Available for Chevy, Dodge and Ford trucks, Warn Heavy Duty Bumpers are designed specifically for each model and designed to follow each vehicle’s grille and body for that sleek, custom-made feel. Warn Heavy Duty Bumpers are manufactured by Warn Industries, which developed their first winch back in 1959 and quickly led the industry for off-road racers, avid 4-wheelers, weekend adventurers and hardworking ranchers. Warn Industries is headquartered in Clackamas, Oregon and produces high-performance, USA-made off-road equipment and accessories. Warn Heavy Duty Bumpers feature a solid all-steel heavy duty construction with a one-piece design, using over 450”of weld to offer excellent front end protection for your truck. They are also powder-coated in a textured black finish with a special Zinc Phosphate undercoat for a corrosion-resistant, classic look that will match all body colors. Warn Heavy Duty Bumpers reuse factory tow hooks for most applications or replace them with welded eyelets for D-shackles. 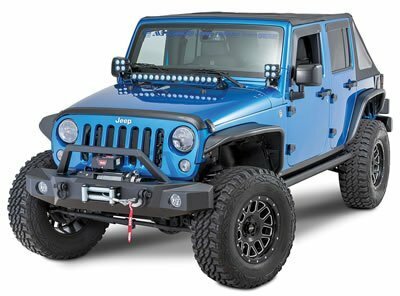 Warn Heavy Duty Bumpers are designed with integrated ports for 5” Warn off-road lights and light mounting holes on top. It’s compatible with large capacity Warn winches including the 16.5ti concealed behind the winch mount. 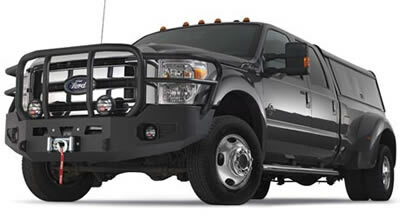 For 1999-2004 Ford Super Duty models, Warn provides a filler plate for no-winch application. Warn Heavy Duty Bumpers are both commercial duty rated and fleet approved and work great with diesel applications and vehicles equipped with oversized tires. Warn Heavy Duty Bumpers are backed with a 1-year warranty. Warn Heavy Duty Bumpers are available in 65 countries and dealt in 250 authorized retail outlets in North America. Unlike other companies who take approximately 4 weeks before they can ship the product, Warn can send it out much faster. Some people found the installation a bit difficult because of so many loose pieces. It may also require you to trim your factory front flare for brushguard clearance. There are also issues with the powder coating. A lot of people experienced chipping and flaking after just a few months and even rusting despite the undercoat. Other than that, Warn Heavy Duty Bumpers are made with high class materials and excellent construction and offers outstanding value for money.